Tanger Med 2 port represents the third phase in the development of Tanger Med port complex alongside the Tanger Med 1 and Passagers & Ro-ro ports. 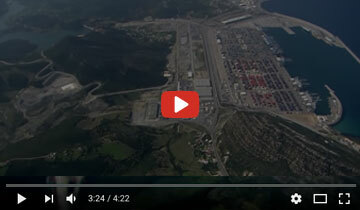 With a total nominal capacity of around 6 million TEUs, the Tanger Med 2 port, which corresponds to a public infrastructure investment of around 14 billion DHS, will bring the total capacity of Tanger Med container terminals to 9 million TEUs, making Tanger Med one of the most important transhipment hubs in the Atlantic and the Mediterranean. Phase I works, launched in 2010 and completed in 2016 which include basic infrastructure (including the main dike) and the first 1,200 linear metres of docks. Phase II works, which mainly include the new docks (over 1600 linear metres) as well as the secondary dyke. The Tanger Med 2 port includes 4.8 km of dikes, a basin with an area of 160 hectares of earth platform fully earned on the sea. With a docking capacity of 7 mega-container ships, the port will eventually total 2.8 km of container docks with depths reaching -18 metres. Tanger Med 2 port, in its completed configuration, will contain two container terminals. Marsa Maroc is the concession holder of container terminal 3 (TC3). 34 hectares. The terminal’s nominal capacity is 1 million TEUs. Terminal 4 (TC4), with a nominal capacity of 5 million TEUs, is licensed to APM TERMINALS, and is considered as the most innovative on the African continent. It incorporates the latest container movement technologies, and is characterised by a 1600 m long linear platform that can be expanded to 2000 m and a surface area of 76 hectares. The start of activities is scheduled for 2019.